Usually as part of a divorce, one person can transfer to a spouse, ex-spouse, or child a portion of their retirement assets as a one-time event without income tax at the time of transfer. This one-time tax exception is typically used to allow ex-spouses to divide retirement assets equitably without incurring negative tax consequences to the division. The document required to complete this transfer is called a Qualified Domestic Relations Order (“QDRO”) or Domestic Relations Order (“DRO”) depending on the type of retirement plan. 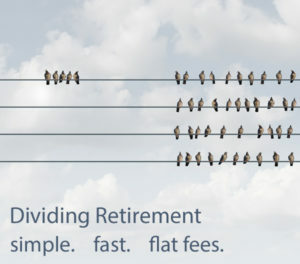 Gray Jay QDROs offers flat fee preparation of QDROs and DROs, and we also offer hourly consulting services to ensure that Divorce Agreements contain the necessary language for the proper division of a retirement account. Choose the level of assistance you want and the corresponding price (between $500 and $1000 per document). See a breakdown of our pricing here. Complete the Intake Form Available Here and return the form to our office per the instructions on the form. Pay the Invoice that we will send from Stripe upon receipt and review of your Intake Form (either via credit card online or mailing a check to Gray Jay Endeavors LLC at 9 Main St., Southborough, MA 01772) . Upon obtaining all of the necessary information requested in the Intake Form the staff at Gray Jay will contact you to confirm that Gray Jay will be preparing a draft QDRO or DRO and to request additional information. If you want to know what kind of information we will be requesting, review our Retirement Division Checklist. If you chose Option 1 in your Intake then we will provide you with the draft QDRO or DRO and you will complete the remaining steps. Upon completion of the draft QDRO/DRO, many plan administrators will review the draft to ensure compliance with the plan rules. If this service is offered by your plan administrator the next steps is to submit the draft QDRO or DRO for pre-approval. If you chose Option 2 in your Intake then we will provide this additional service. If you do not pay the additional $250 fee then you will be responsible for submitting your QDRO or DRO for pre-approval. Once pre-approval has been obtained (assuming this option is available in your case), the QDRO or DRO is then ready to be submitted to the Court. If you chose Option 3 in your Intake, Gray will provide a Joint Motion form to Approve QDRO/DRO and will assist you in providing the final QDRO/DRO for signing and submission to the court. The Court typically sends back a copy signed by the Judge in a few weeks. This signed copy must then be submitted to the plan administrator for implementation. Once the QDRO is approved officially, the plan administrator will contact the alternate payee (the spouse who is receiving a share of their spouse’s retirement) to make the final arrangements for the transfer. Depending on the type of account (401k, IRA, pension, etc.) these arrangements may take different form. If you do not request these additional services from us, then once you have the pre-approved QDRO/DRO it will be you or your attorney’s responsibility to submit the QDRO/DRO to the court and then to the plan administrator. If you do not complete these steps then the QDRO/DRO will not be implemented. If you have any questions about which is the best Option for you please give us a call at 508.293.4011 or e-mail us.